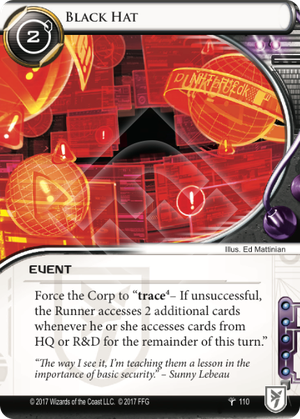 Force the Corp to "Trace – If unsuccessful, the Runner accesses 2 additional cards whenever he or she accesses cards from HQ or R&D for the remainder of this turn". Oh my god, there's a goddamn black hat shape in the negative space between all the red error pop-up windows. How did I not see this sooner, how could I have been so blind? If you run Black Hat, you won't be as oblivious as me, cus you'll get to see all the juicy cards in HQ or R&D. Or both if you're crazy.